Tokai is a region which is easy to visit as a day trip from Kansai or Tokyo. There are many historical places such as Nagoya and Iseshima. Let’s enjoy sightseeing and join and enjoying the events which are held in this region. This time we’ll show you events in Tokai that are held in February. Kawazu zakura are cherry blossoms which are early blooming. About one month at the beginning of February till the beginning of March at Kawazu-cho Kamo-gun, Shizuoka. The specialties of this cherry blossoms are large and beautiful flowers in pink colors. These cherry trees are early blooming and you can enjoy the flowering process. Especially in Kawazu cho, the cherry trees are certified as a symbol of the town since April in 1975. 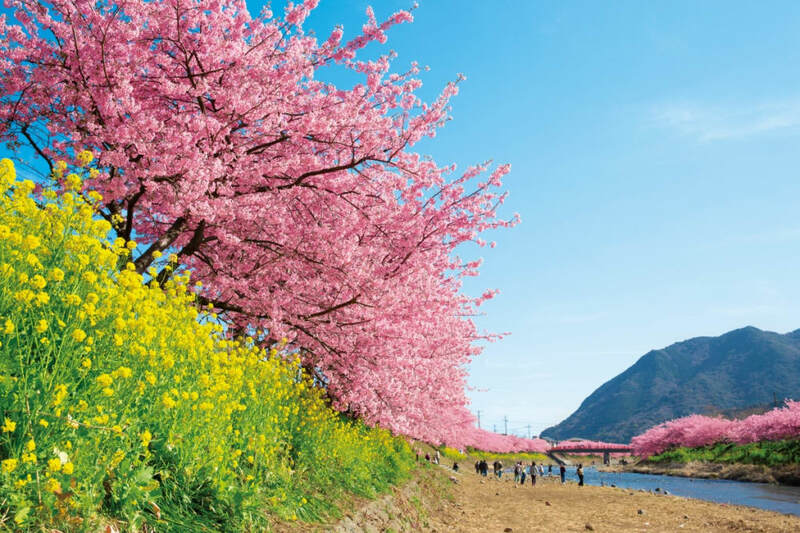 “Kawazu Sakura Matsuri (Cherry Blossom Festival) “is every year held at the beginning of February for one month and about 800.000 people visit to watch the wonderful blossoms. Along the river you see 800 cherry trees. In total you see about 8000 cherry trees and you will feel that spring has arrived during this festival. You will find many market stalls at the evening. The cherry trees are illuminated and you can enjoy several other side events. Many snow falls in Okuhida region in Gifu prefecture. Nyukawa-cho,Takayama, Gifu is an area known for its heavy snow fall. This time we’ll show you about sightseeing spots of this town, “The Hida Great Limestone Cave”. On the way to the cave, there is “The Ohashi Collection Kan Museum’. You can see many artworks and articles of adornment from around the world or the block of gold (current value approximately three hundred million yen). Admission to the museum is included in Limestone Cave admission fee. Inside the cave there is a sake/wine cellar or “Tsuki no sekai (moon world) – as if you were standing on the moon and many other interesting spots. When you go out from the cave, you’ll see “Ice canyon”. Beautiful Pale icicle are the natural art created by the land of severe winter. The canyon lasts about 300 meters long. On specific dates of February, the “Ice canyon” will be lighted up. Let’s go to enjoy special seasonal event. Naoishinji Hadaka matsuri (Naked Festival), common name is Kōnomiya Hadaka matsuri. This is a traditional festival which is held at Owari –Ōkunitama-jinjya shrine (Kōnomiya) in Inazawa-shi Aichi. It is held every year January 13th till next morning of old lunar calendar and designated” Intangible Folk Cultural Properties” of Aichi prefecture. During this festival, more than 1000 men try to touch Shinotoko (a statue of the god of men) to relieve misfortune or disaster. The struggle of a large number of bodies. It’s a spectacular event you must see! Besides the day before this festival, 50 Kagami mochi (a round rice cake) are offered to the god. The day after this festival, many worshipers visit this shrine to get mochi to wishing to be in good health. Naoishinji　Start at 3:00 P.M.
Pray 5:00A.M. – about 6:00P.M. While there are prizes to be won from stamp rally. 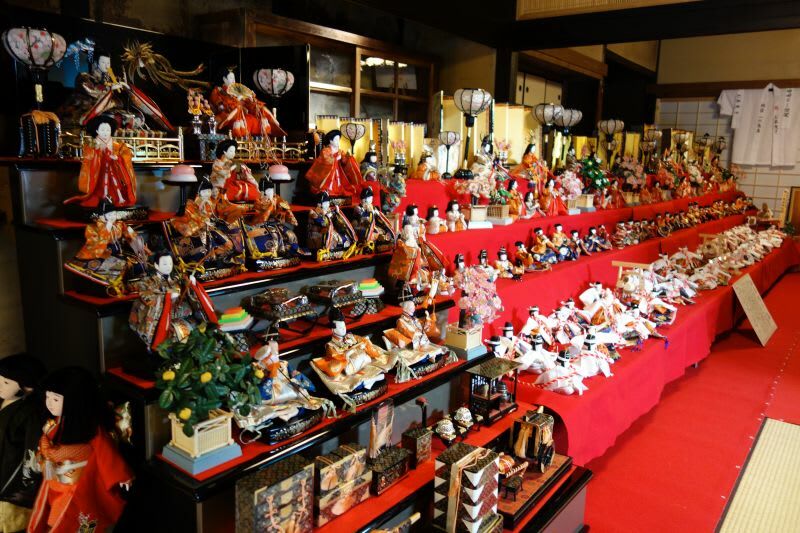 On the day of hinamatsuri (doll’s festival) March 3rd , Hinamatsuri market will be held and you can buy related goods and enjoy the festival Let’s enjoy doll’s festival and feel early spring in Kameyama-juku/Seki-juku. “B-class gourmet all gathering! “ is a special event for “Kawasu-sakura matsuri (cherry blossom festival)”. B-class gourmet means locally cheap produced but good foods. ikameshi (squid cooked rice) styled cooked rice, fried squid, Danish pastry, Ramen, yakisoba( Stir frying noodles ), potato, Korokke(Japanese styled croquette). Sanma( mackerel pike) sushi, Shizuoka beef steak, wasabi pork buns, and others which are usually you only can eat at east of Shizuoka ,Izu area. Let’s try and find your favorite dishes. This are is famous for early-blooming cherry blossoms. Enjoy food & cherry blossoms!